Even non-heroes can save the day. As evil fast approaches and the last of the real heroes is killed it falls to you, the most unlikely of heroes, to save the day and root evil from the land. How are you going to do that? Thankfully the there are three lucky charms that the King has left which should you gather them all together will restore order. To do that? 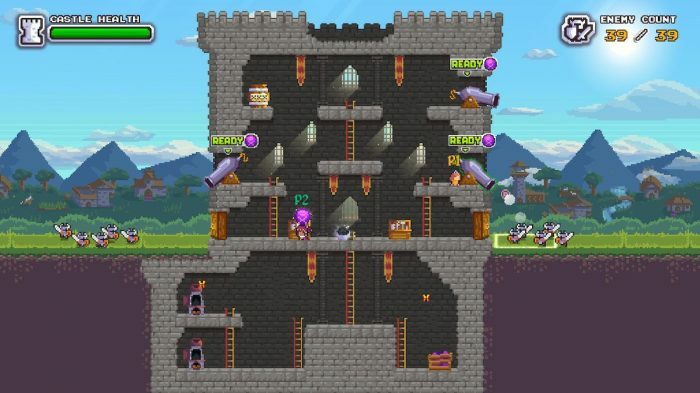 You’ll need to protect castles all over the kingdom to complete your mission. Defending a castle is not an easy feat as you will need to not only hold off against ever growing waves of attackers but also manage the equipment needed to do just that. As No Heroes Here is a co-op venture, the hectic nature of the gameplay is made easier and more enjoyable by having a helping hand. Thanks to having both local and online co-op play with support for up to four players the castle need not ever be empty. 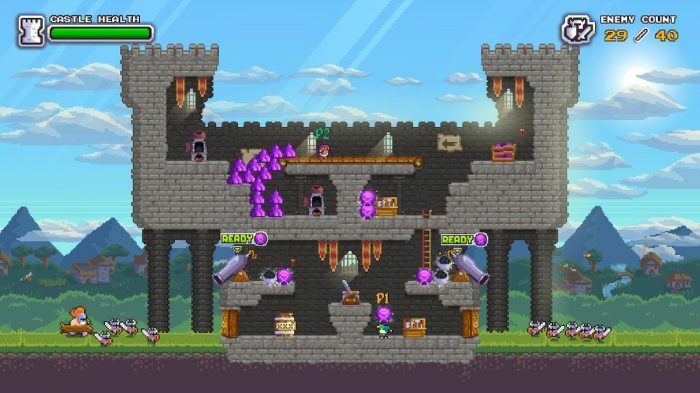 To defend the castle, you’ll need to make use of the numerous cannons placed on each side. As enemies approach they will walk through grid spaces which can be fired on using the cannons. As each one has a set range you’ll need to time your shoots to ensure you make contact and maximise your damage output. To fire the canons, you will need to load in cannonballs and gun powder which you’ll need to make during the siege as well. This management of your resources, and the task everyone performs, will be what makes or breaks your defence of each castle. Should you let the pressure get the better of you then you’ll so find the enemy winning over you. Though No Heroes Here is intended to be played with up to four people it is possible to experience the title as a solo player. When on your own, there will still be two characters present in the castle, but you’ll need to swap between the two to manage everything needed to ensure a victory. This can be even more hectic then playing any other way making solo player something I would not recommend unless you are really looking for a challenge. With over fifty levels across three regions, several different challenges to complete, there is plenty of content to enjoy. During the adventure you will be able to unlock a few different playable characters all of who are non-heroes and take them into battle against twelve different enemy types. If that wasn’t enough, there are even a few different special ammunition types you can use to change up gameplay. All of this is given present in a pixel art style that is colourful and full of character, with character animations that are sure to make you smile. Furthermore, No Heroes Here also runs super smooth on the Switch making for a truly solid gaming experience. Controls are straight forward and accessible, but character movement can feel a bit awkward as ladder climbing is somewhat sticky and throwing items doesn’t respond always as intended. It doesn’t ruin the experience but in hectic movements it can cause issues. At the end of the day, No Heroes Here is a highly enjoyable videogame that offers a unique co-op experience that is completely worth checking out. 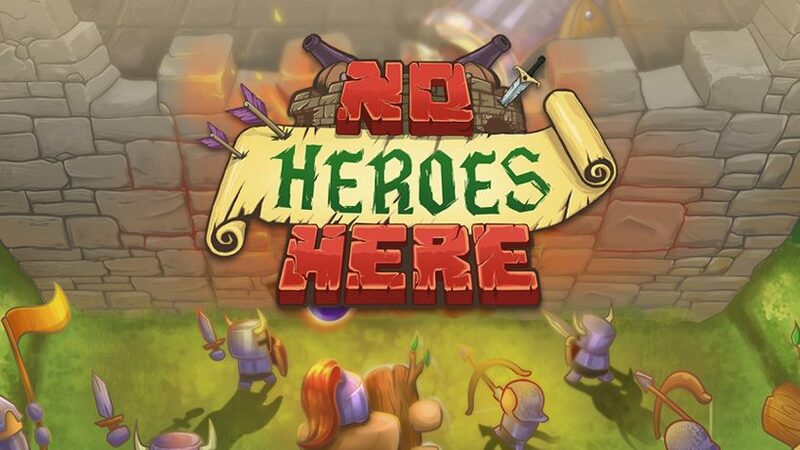 If you are looking for a co-op experience that is a fun, hectic and rewarding, then look no further than No Heroes Here.